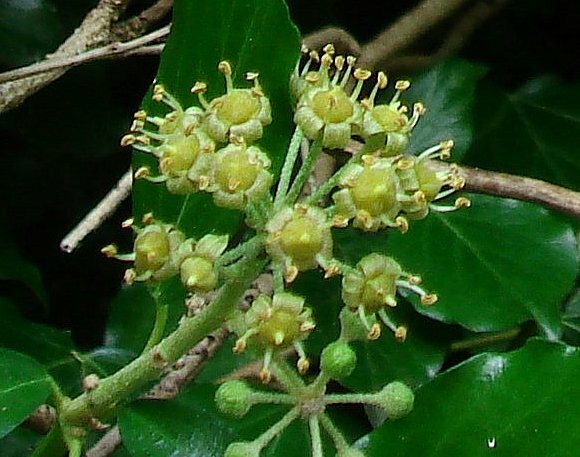 Young leaves (without teeth) and the flowers. 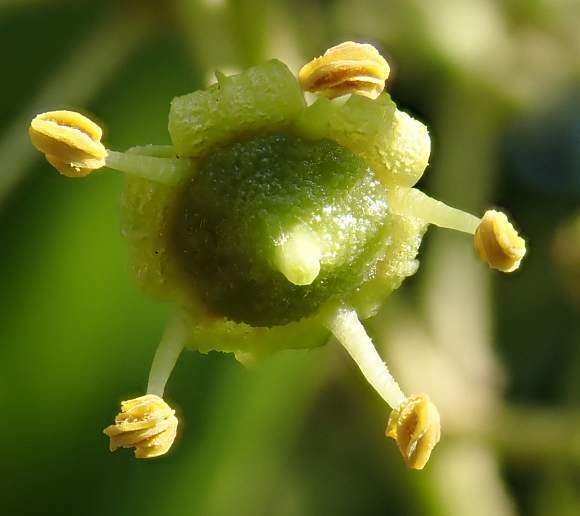 The lower dome is in flower, with green flowers, the top-most one in the early stages of fruit. 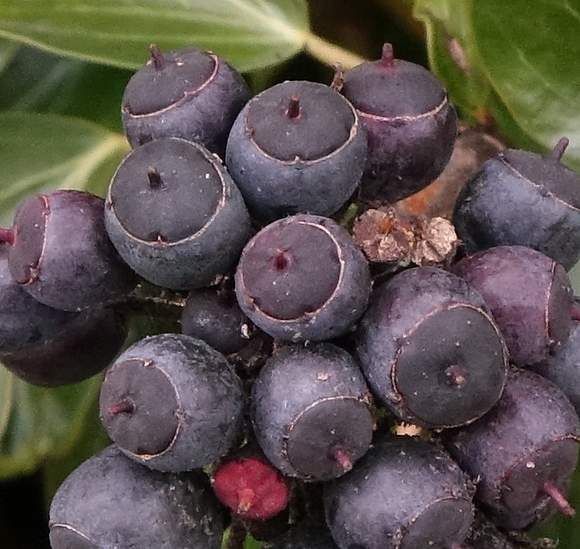 Topmost dome has only just started turning to fruit, the others the 5 petals have yet to un-furl. Petals not yet unfurled on these flowers. Insect just love the nectar. 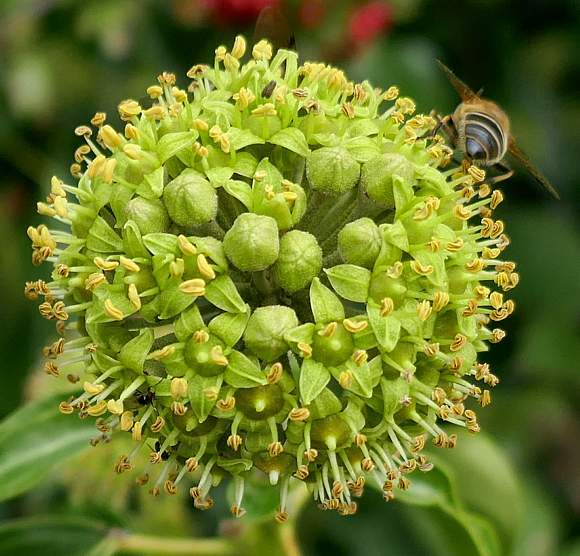 In the centre of the flower-globe are flowers yet to open. Two more insects enjoying the nectar. Five pale-green petals now un-furled revealing 5 anthers on each flower and a short single central style. The flowers appear in Autumn; the fruits the next spring. Two flowering globes each on their separate stems (there is another behind). 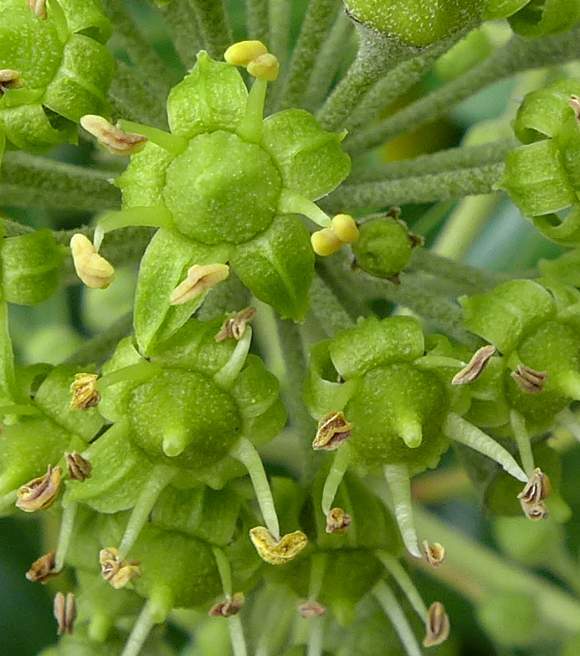 Flowers in a 'globe' formation on longish stalks, each emanating from a point, this being a simple umbel. The 5 petal of the three flowers in the centre have yet to part to reveal the stamens and style within. 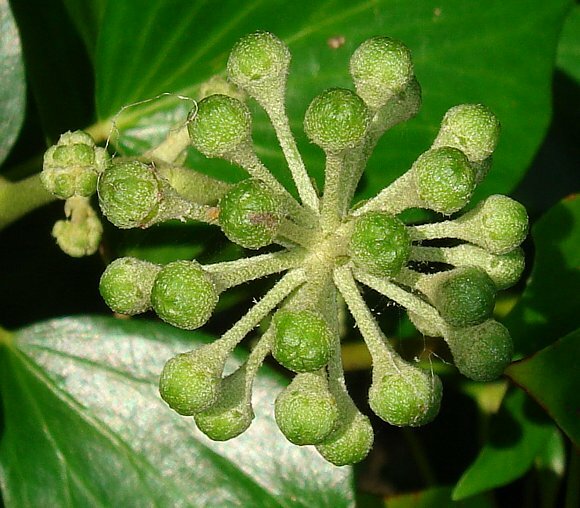 The 5 paler-green petals are actually petals, not sepals. 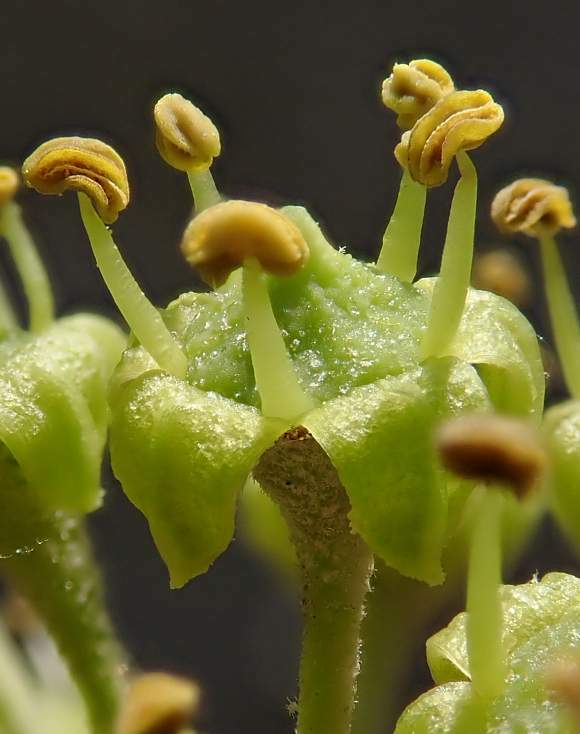 The flower sits in a cup-shaped sepal (which actually does have 5 very short teeth between the petals). The cup is shaped like a golf-tee, tapering seamlessly and gradually into the flower stalk, just like a golf-tea does. 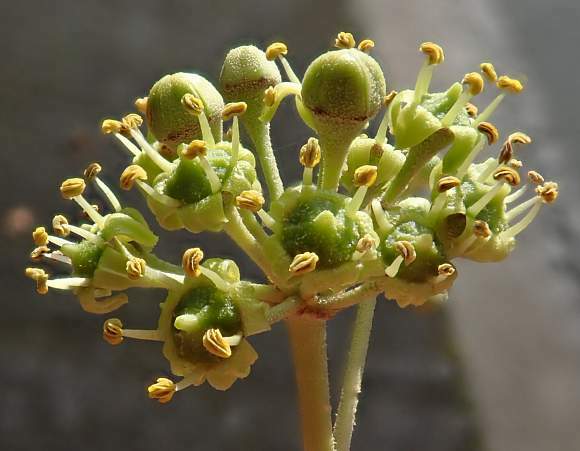 Flowers with 5 green petals which are initially radial but then curl underneath, 5 cream-coloured anthers and a short paler-green style in the centre. The 5 petals are fairly robust for their size. 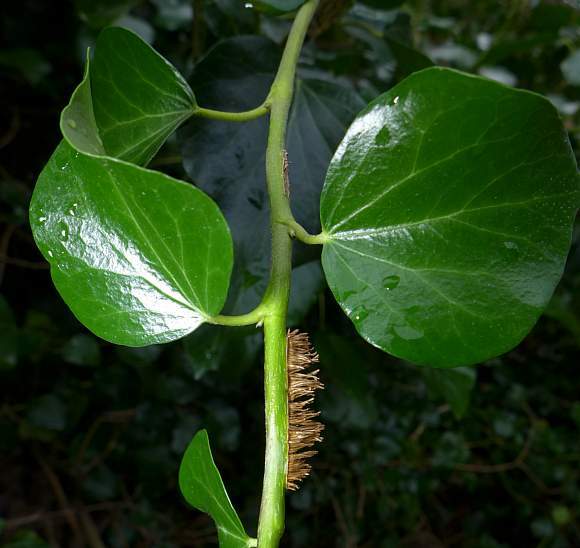 At first they open outwards, it seems, and then fold under (unless, of course, this specimen is of a different species of Hedera?? - it is quite possible, there are two other species and many cultivars - and this is a different specimen to the others from Silverdale taken on the 25th Sept 2008). 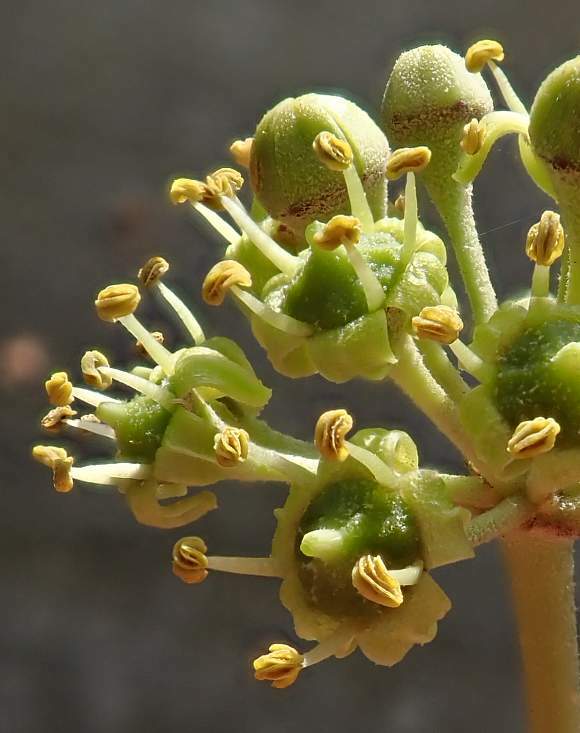 The stamens with yellow/green turning brown anthers at their tips protrude outward and upwards. Ovary green/yellow at first with short style in centre. An as-yet unopened flower. Just like the leaves, it is covered in stellate hairs with perhaps up to 8(?) 'spokes'. 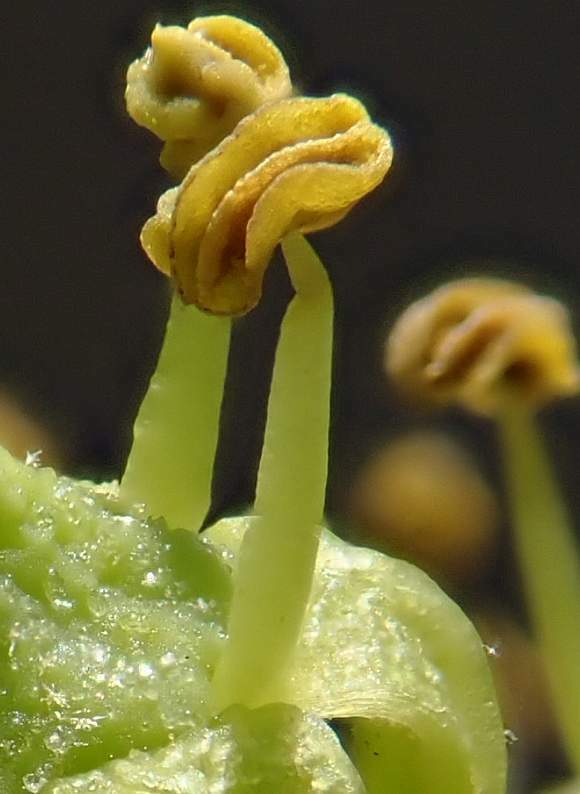 The sepal cup tapers gradually into the stalk. The shape is reminiscent of a microphone with a foam covering or an ice-cream cornet. 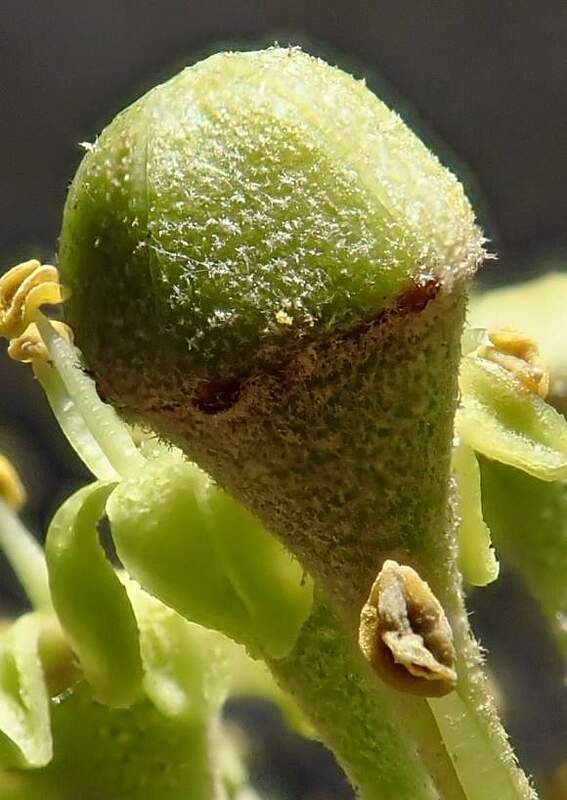 Overhead view of flower with a short central style and 5 stamens. The petals are reflexed backwards. More stellate hairs on the ovary and style. A filament with an opened creamy-yellow anther atop. The filaments lack hairs. Recently developed fruits, remains of style still in centre. 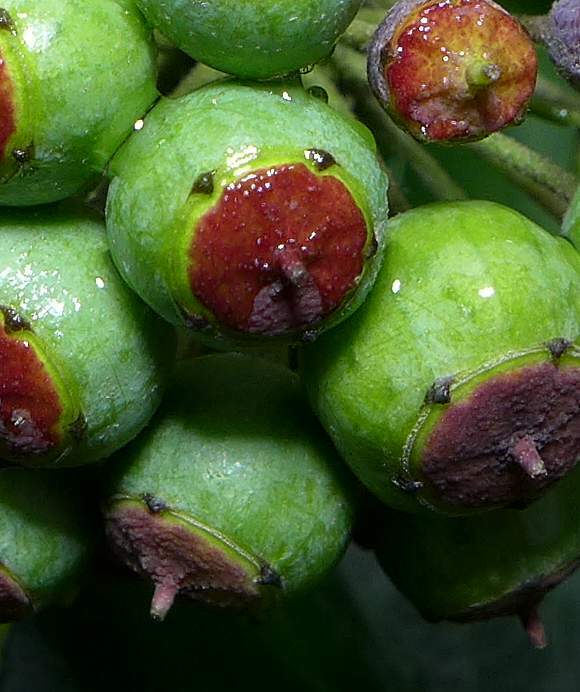 Fruit green at first turning yellow to red then purple before finally finishing black when ripe. 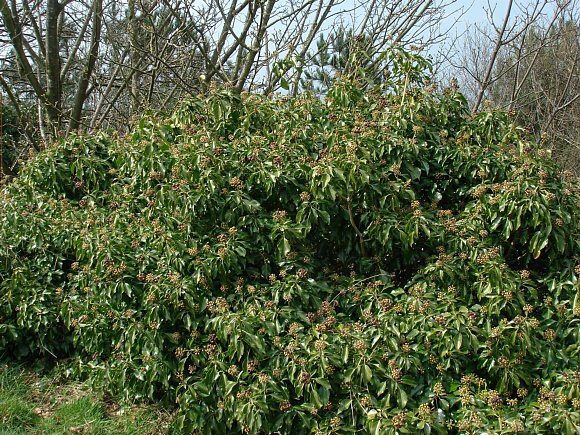 Older leaves darker green and 5-lobed. 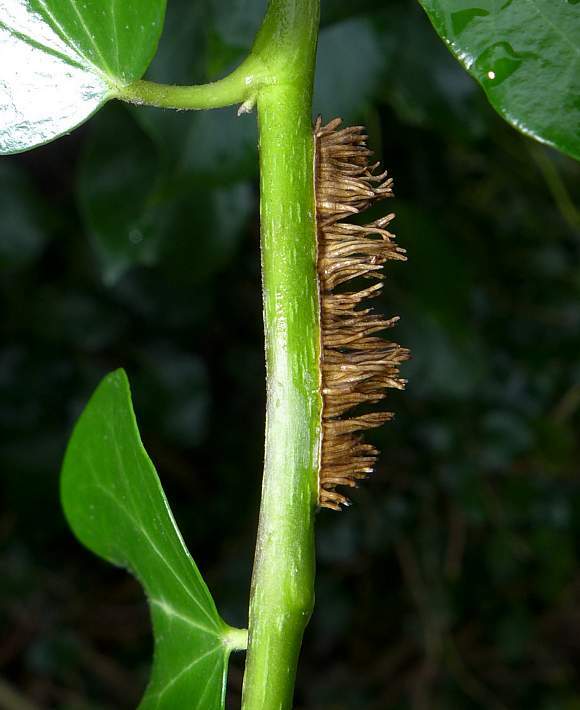 Numerous short roots are presented on climbing stems. These have yet to find a substrate on which to take hold. Short roots awaiting an opportunity to take root providing the growing stem reaches a suitable surface on which to take purchase. 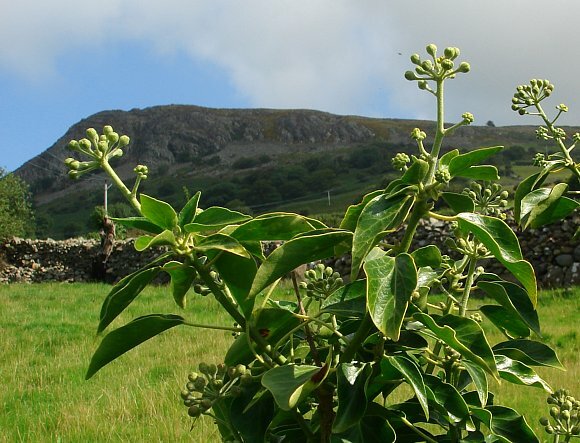 Not to be confused with: Poison Ivy, a non-native climber/small shrub which is highly toxic (and which does not, as far as your Author is aware, grow in the UK). It can cause severe and damaging blisters when touched. 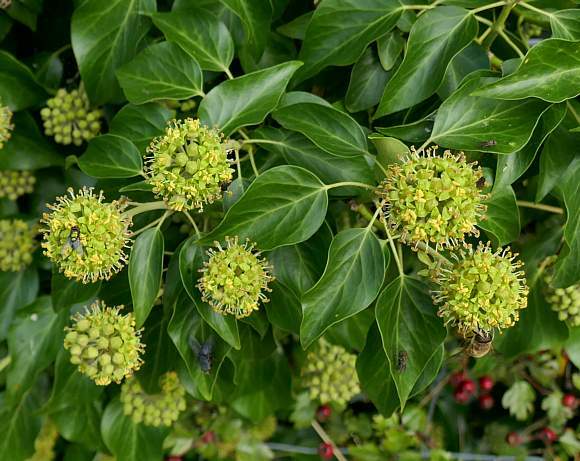 Lookee-Likees : several other Ivies, most of which are non-native and escaped from gardens. 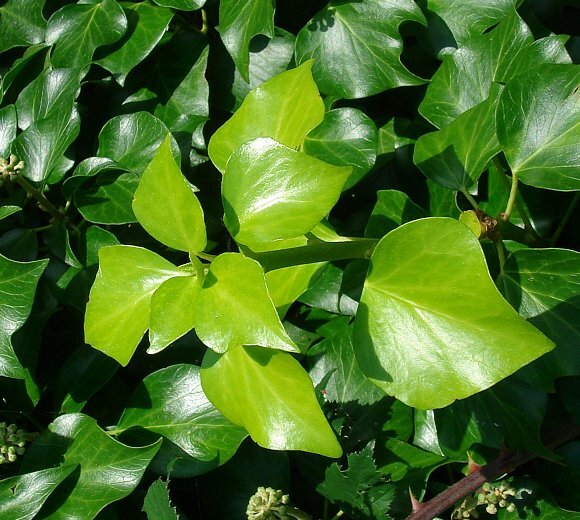 The sap of Ivy, if it comes into contact with the skin, can cause dermatitis, sometimes with severe blistering and inflammation. 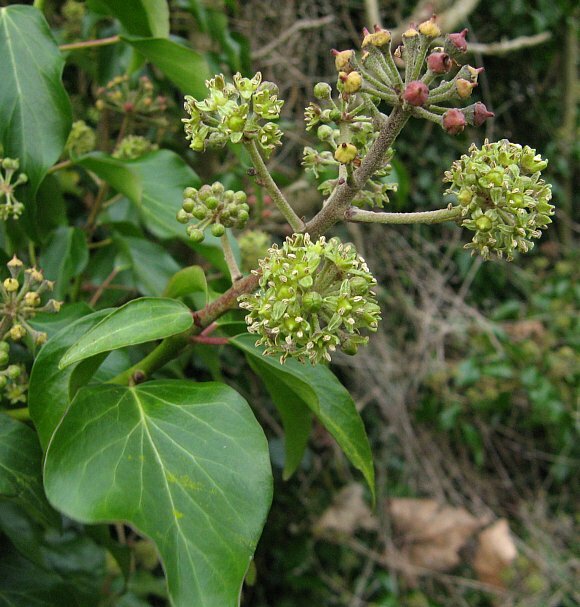 The flowers of Ivy make a useful contribution with providing out-of-season nectar to butterflies in late autumn. 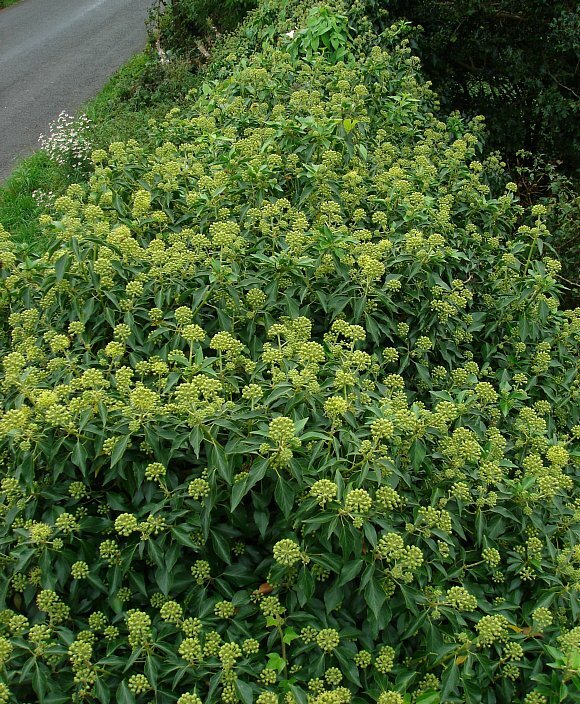 This is especially important in really wet and cool years when flowers are not in great abundance, such as the record-breaking wet year of 2012 (which was drought-ridden until April, then it almost never stopped raining, flooding huge areas time and time again, month by month). Although it has 'roots' which readily attach themselves to substrates such as fences and trees, the 'roots' do not draw sustenance from the tree it climbs: it is not parasitic. And, contrary to common thinking, it will not strangle trees and prevent them from growing; far from it, it avoids going anywhere near the smaller branches where the leaves of the tree harvest sunlight. 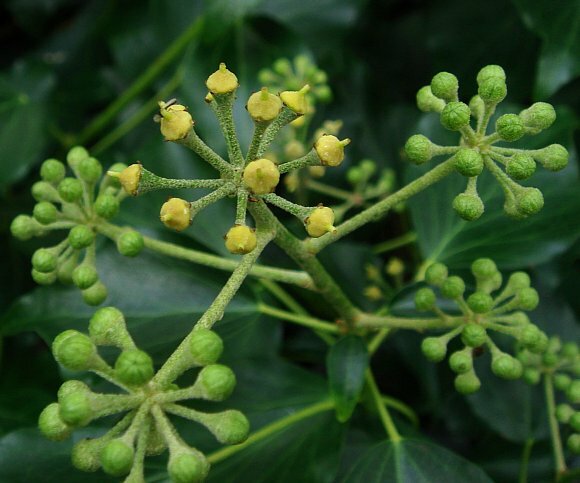 Falcarinols are naturally occurring acetylenic alcohols (note the two highly energetic triple bonds, extremely unusual in the natural world) present in (English) Ivy. 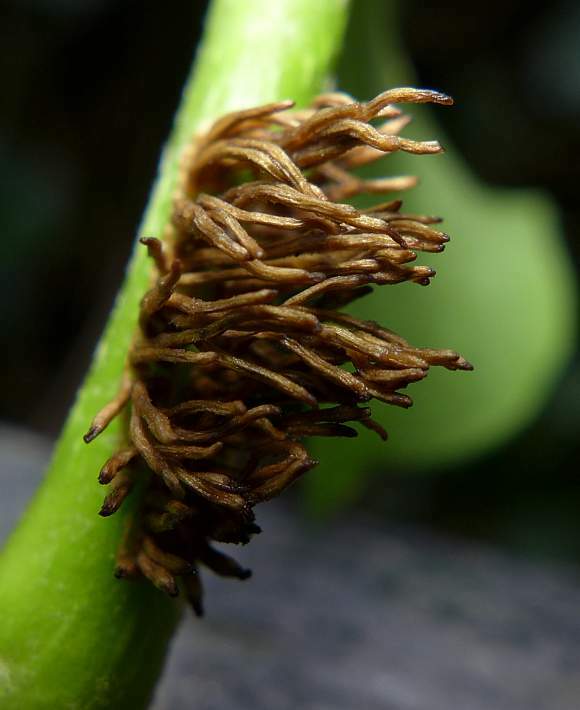 They are strongly fungicidal, a natural defence from invading organisms. 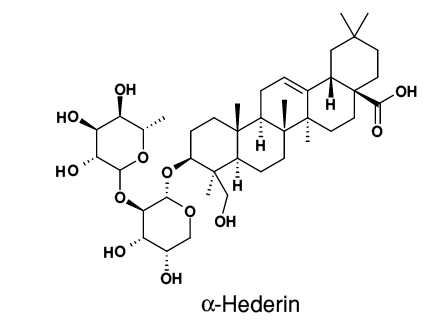 In their fungicidal role, they often function as phytoalexins, the mammalian equivalent being anti-bodies. 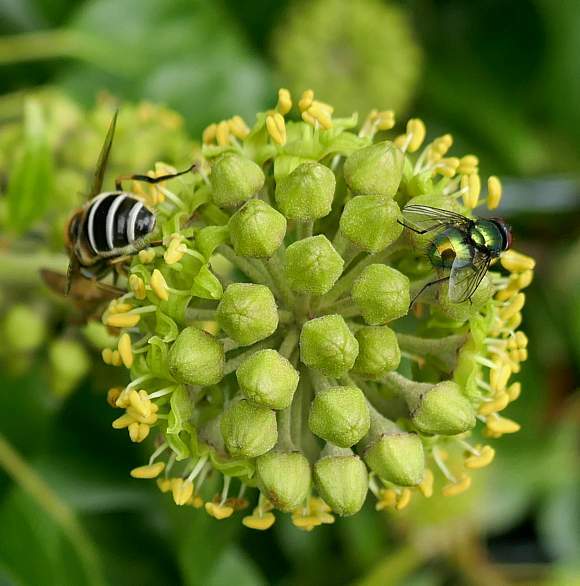 In Ivy, they are both allergenic and irritant to humans. Another polyacetylene (aka polyyne ) is also present: 11-dehydrofalcarinol . 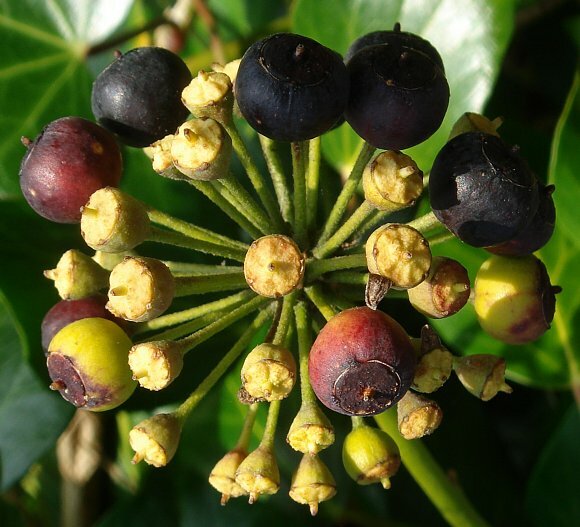 Falcarinol (aka Panaxynol) is present in Ivy and in Hemlock Water-Dropwort (Oenanthe crocata) and causes contact dermatitis in certain individuals when the plants are handled. Falcarinols also occur in the roots of carrots, their concentration increasing with prolonged storage. In carrots they can cause allergenic contact dermatitis, an occupational hazard for carrot pickers. Because of the highly reactive triple-bonds, polyacetylenes such as these are very toxic. 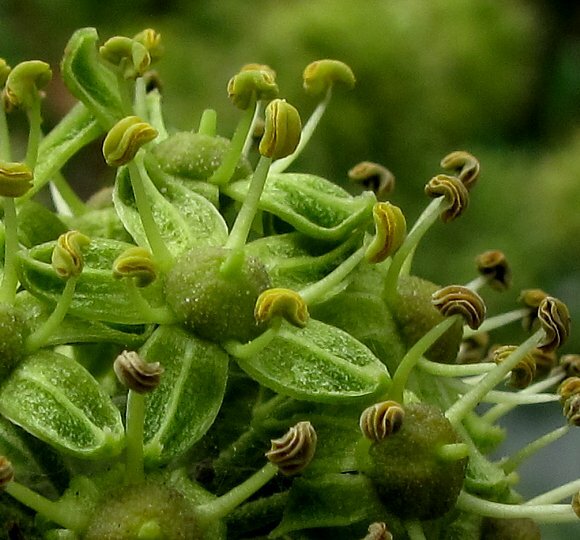 The flowers of Ground-Elder contain the highest concentration of falcarindiol, up to 9% by weight. 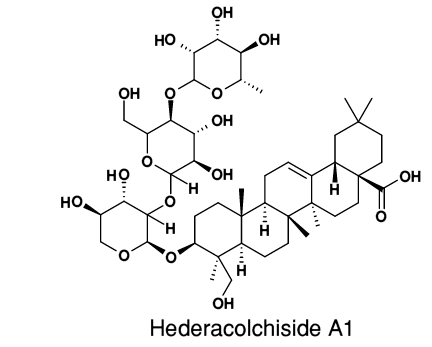 Falcarindiol has been shown to possess anti-cancer activity. 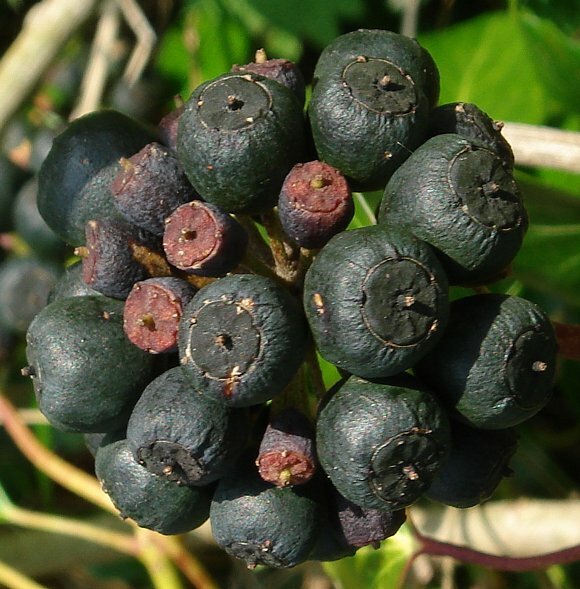 Some other umbellifers also contain compounds containing triple-bonded carbon atoms. 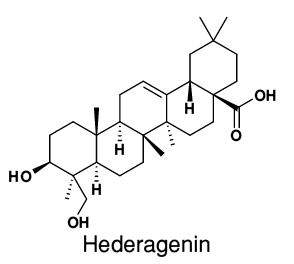 Hederagenin is a saponin and pre-cursor to many of the compounds present in Ivy, some of which are shown below. 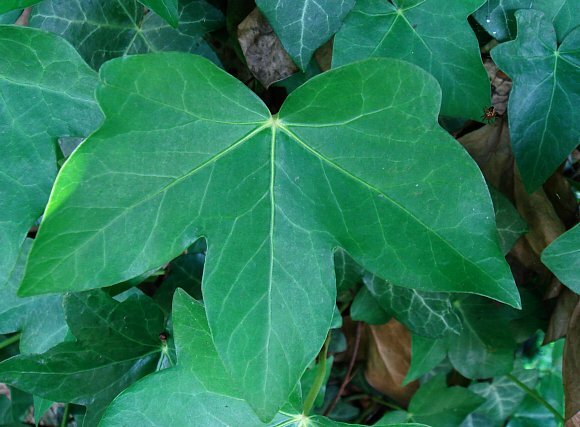 It is not a main component of Ivy. Bayogenin is almost identical except that an extra 'OH' is added on the carbon atom just above the left-most 'HO-' group. 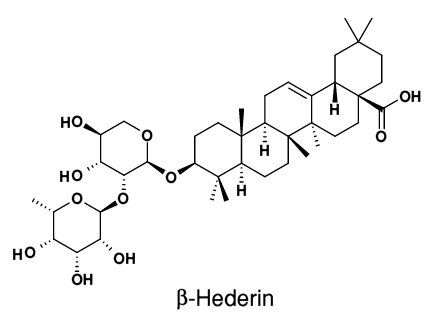 Ivy also contains a number of hederasaponins, which, by partial hydrolysis and loss of sugars, leads to α-hederin, β-hederin and hederacolchiside A1, which are being investigated for their possible use in treating lung cancer and leishmaniosis, the latter of which is caused by a water-borne parasite which lives in tropical areas.